With the aurora borealis expected to reach further south tonight due to a solar storm, we take a look at the best way to capture the natural phenomenon. A strong aurora is one of the most breath-taking sights to see, but capturing it on camera can prove tricky. Pick a spot with a good view of the horizon to the north - while you may not be lucky enough to see the spectacle right above your head, chances are good that you'll catch a glimpse of the green sky in the distance. Get as high as possible - altitude will increase your chances of seeing further into the distance and get a better viewing angle. Predictions vary, but the US National Weather Service posted "you may get a chance to see the Aurora if you live in the Northern lower 48." Though predicting possible views in the US as far south as Minnesota, in Europe 48 degrees latitude is just south of Munich. UK based predictions have southern England as an optimistic reach. To photograph the aurora borealis you'll need to bear the following in mind. Tripod: You'll need a long exposure to capture the aurora, so stability is very important. If you ever try to take a hand-held photo at night without a flash, you'll be familiar with the blurred messes that result. Bear in mind that most places in Ireland are quite windy at the moment, so consider some shelter when setting up. It's surprising how much the vibrations from a strong wind can shake your camera. Camera: It's all about the low light capability here. If you're using a DSLR, you'll want a lens with a wide aperture and suitably high ISO. You want to avoid going too high with your ISO, because you'll get a lot of noise in your shot. If you're using a compact camera, you'll want to keep the flash off and hopefully you have some manual controls. A phone is never recommended, but you'd be surprised how good some shots are. Keep it on manual - none of the presets are likely to know how to deal with the aurora. Set your focus on infinity, then auto-focus on the moon (or a bright star) and find the sweet-spot you're happy with. Secure this focus as best you can, at the very least turn off auto-focus. You're going to need a long exposure. A good starting point is 15 seconds (hence the importance of that tripod,) while on about ISO800. Ideally you'll want to bring your ISO lower, but this will depend greatly on your lens. The aurora can appear in different strengths, so no one setting will always work. Have a rough idea and take a number of different shots until you're happy. Your aperture should always be wide, so you're really just balancing ISO and shutter speed. 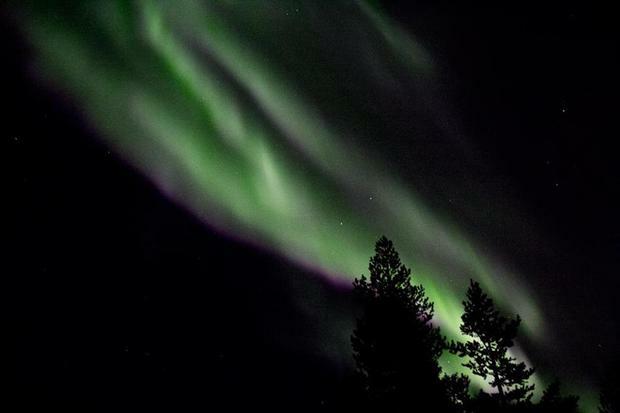 Although the most famous and most common aurora is green, the colour changes depending on which elements are interacted with and where in the atmosphere the interaction occurs. Consider yourself very lucky if you can capture some purple. If all else fails, don't be afraid to break the rules. I took the photo below while wandering in on a frozen lake in Sweden. I had no tripod, but I did have a very high ISO. While not as magical as most and quite grainy, it still serves as a good reminder.